Welcome to the multi-cloud world. I’ll be the first to admit that I have always been a bit persnickety when it comes to language, especially in the technology world. In fact, I penned Message Not Received in part as a form of linguistic catharsis. In my defense, I’m hardly the first person to realize that writing costs much less than than therapy. That book details how the tsunami of business jargon is overwhelming folks at work. Neologisms, forced portmanteaus, backcronyms, and new buzzwords permeate the business landscape these days, but it gets even worse: Many people struggle trying to discern what even ostensibly simple and commonly “understood” tech terms actually mean. Case in point: “the cloud.” As I’ve said many times, there is single “cloud” any more than there is one app or database. There are many reasons for the emergence of a multi-cloud world. 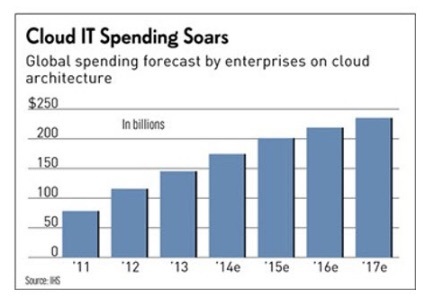 For starters, it’s no overstatement to say that cloud computing is exploding. What was once by all accounts a niche market may approach $256 billion by 2018. Predictably, prices have dropped considerably as well. The result is a virtuous cycle that has fueled increased adoption. “Evolved” is putting it mildly, but there are more reasons that the idea of multiclouds has gained considerable traction as of late. There is no single “cloud” any more than there is one app or database. Next up, remember that cloud computing is a means to an end—and that end is usually some type of business or consumer application. Fortunately, there’s never been greater portability with respect to deploying and migrating these applications. Thanks to tools such as Docker (a new IBM partner), organizations of all sizes can switch clouds and vendors faster and easier than ever. This is dramatically different than things a decade ago. As I know all too well, fear of system failure and operational issues have led many CXOs to delay the deployment of key business applications and maintain antiquated ones. Don’t get me wrong. I can’t advocate an organization using 25 different clouds from 24 different vendors. Complexity can still hamstring an organization and engender massive data issues. Still, no longer do companies need to limit themselves to a single cloud or vendor.